Daniel Day Lewis refused to leave a wheelchair while filming My Left Foot, Heath Ledger immersed himself into the mind of the Joker for Batman and Christian Bale toyed with death by dropping 120 pounds for The Machinist. Some actors go to quite extraordinary lengths to get into character for a role, but Nic Cage went as far as scaring his co-workers on the set of Spirit of Vengeance. Reviving his role of Marvel's leather clad Johnny Blaze for the upcoming Ghost Rider film, the Leaving Las Vegas star wanted to give an authentic as possible portrayal. So how do you get into the mindset of a cursed stunt motorcyclist who becomes a hellblazing vigilante? But believing yourself to be a soulless antihero even when the cameras aren’t rolling can cause some problems with your fellow thespians. 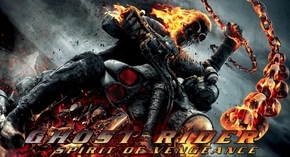 Spirit of Vengeance sees Johnny Blaze recruited by a secret sect of the church to save a young boy from the devil, and possibly rid himself of the curse.